Online wills from 1858 onwards? What are piece numbers and folio numbers? Whenever possible links are included to the websites or articles mentioned in the newsletter (they are highlighted in blue or purple and underlined, so you can't miss them).For your convenience, when you click on a link a new browser window or tab will open (so that you don’t lose your place in the newsletter) - if nothing seems to happen then you may need to enable pop-ups in your browser or change the settings in your security software, but first try a different browser (such as the free Chrome browser which I use) . Findmypast.co.uk have come up with a great offer - buy a 12 month World subscription for £129.50 and get a free £50 voucher to use online at JohnLewis.com (think of it as an early Christmas present)! Note: see Stop Press for details of another Findmypast offer which covers ALL of their subscriptions and ALL of their websites. With a World subscription you'll not only have access to Findmypast's British records and newspaper articles, you'll also have access to their collections from Ireland (including Northern Ireland), Australia, New Zealand, and the USA. As recently as February you could have paid £159.95 for a Findmypast World subscription, so even without the voucher the current price represents a big reduction - and if you take into account the value of the voucher, the net cost is HALF what you might have paid earlier this year! It's also less than you'd currently pay for a Britain subscription. To take advantage of this offer, which ends on Monday 3rd November, just follow this link to the LostCousins offer page at the Findmypast.co.uk website (please make sure you read the terms and conditions). Over the past year Findmypast have added scores of new datasets and extended others. For example, we've seen the Shropshire Collection with over 2 million parish records, and the first phases of the Devon, Staffordshire and Yorkshire Collections, each with millions of parish register entries, and the first part of a massive new collection, the National School Admission Registers and Log-books 1870-1914. New military records include almost 450,000 Royal Air Force & Royal Flying Corps service records, most of which are online for the very first time, numerous army records, including the PALS battalions, the Honourable Artillery Company, and the most complete collection of WW1 service records (over 4.2m entries have been indexed, including nearly 600,000 new names). Australian records added during 2014 include Victoria Passenger Lists (there are now over 24 million records in the Australia & New Zealand travel and migration collections alone), US records include New England Naturalizations 1791-1906, and in Ireland the Petty Sessions Court Registers have expanded to 21 million records. Other news from Findmypast included the announcement of a joint project with the National Archives to put the 1939 National Register online - since the 1931 Census was destroyed, and the war prevented the taking of a census in 1941, this is the closest thing to a census that exists for the 30-year period between 1921 and 1951. Also big news was the takeover of Origins.net, whose records - including the National Will Index - are in the process of being added to Findmypast's existing database of 1.8 BILLION records. Note: if you find that the links in this article don't work, please disable any adblocking software and try again (or use a different browser - I use Chrome). It was John Spedan Lewis, the eldest son of John Lewis, who turned his father's retailing business into a partnership, owned by the people who worked in the business. Over the past half century every employee has received an annual bonus averaging 8 weeks' pay - money that would have gone to shareholders in a more conventional business. But the John Lewis Partnership don't just look after their employees - they also treat their suppliers fairly, something that other big retailers are often accused of failing to do. LostCousins member Peter Cox worked for the John Lewis Partnership for 35 years. After retiring he researched and wrote Spedan's Partnership, which tells how a tiny Oxford Street fabrics shop grew to become the most successful employee-owned business in Britain. In March this year those of us who were fortunate enough to be in Portugal for Genealogy in the Sunshine heard Peter talk about how we too could become published authors! Amazon can only offer used copies of Spedan's Partnership, at around £20 each before shipping - but the author has a few new copies which he has kindly offered to LostCousins members for just £10 (plus £2.80 postage within the UK). He might even sign them for you, if you ask nicely! You'll find his website here - please be sure to mention that you are a LostCousins member. Note: you can hear John Spedan Lewis speaking on the wireless in 1957 if you follow this link. At the beginning of October Findmypast.co.uk announced their new Findmypast First programme, which offers a wide range of benefits to subscribers with 12 month subscriptions - you can read more about them here. Currently there is no equivalent programme for other Findmypast sites - Findmypast First is exclusive to Findmypast.co.uk; please also note that some of the benefits may not be available to subscribers who live outside the UK. Note: if you take out a World subscription under the offer above you'll automatically qualify for Findmypast First privileges. It's rumoured that once the beta test of the Probate Service website offering online ordering of wills from 1996-2014 is complete, the project will be extended to cover all England & Wales wills from 1858 onwards. If there's any truth in the rumour then it's particularly important to submit comments using the Feedback link on the Probate Service website - it will be a lot easier to get them to iron out problems now, especially since there's an outside contractor involved (Iron Mountain). Army wills were the first modern wills to be made available online - the collection now includes 278,000 wills, and covers WW2 as well as WW1. You might find this Guardian article interesting. Note: you can already search the National Probate Calendar 1858-1966 at Ancestry - this will tell you whether or not your ancestor's estate went to probate, and if so, whether there was a will. In the last newsletter I mentioned that the problems of the Passport Agency, which includes the General Register Office. Today the Public Accounts Committee roundly condemned the failure to deal effectively with asylum cases - some 29,000 applications in progress data back to 2007 or even earlier! You can read more about this latest debacle in an article on the BBC website. Most DNA companies can only match your results with those of other people who have tested with the same company - but Family Tree DNA allows people who have tested with other DNA companies to submit their results (provided the tests are compatible). Currently they have a special offer for those who have tested their autosomal DNA with Ancestry.com or 23and Me - you can transfer your test results free, and you'll also see your top 20 matches free of charge. You can then unlock ALL of your matches for free by recruiting 4 other relatives or friends to transfer their results using a special link - or else you can pay $39 for instant access. Since it costs nothing to transfer for your test results and see the first 20 matches there doesn't seem to be anything to lose. And, of course, those of us who chose Family Tree DNA's Family Finder test in the first place will gain from having an even larger pool to compare against. It's not only DNA tests that become more useful when there's a larger pool to compare against - the same applies to matches at LostCousins. The more members there are, the more cousins of yours (and mine) there will be among the membership. All of us who have been researching for a few years (or a few decades!) will be in touch with cousins who are also researching their family tree - so why not invite them to join LostCousins? After all it's free to join and search - and, because there are several free weekends every year, nobody has to pay a subscription (though I'm very grateful to those who do, as it helps to keep the site going). A lot of members who have yet to complete their My Ancestors page tell me it's because they're confused about the census references. Since I was also rather befuddled by talk of piece numbers and folio numbers when I first started my research I thought it might be a good idea to explain them for the benefit of anyone else in the same position. The National Archives has a long article explaining how to 'cite' documents, which explains that a "piece is not a single piece of paper; it may be a box, volume, file, roll and so on". However, all you really need to know is that, in the case of the censuses, a piece is a bundle of enumeration books. Piece numbers aren't shown on the documents themselves, but when the 1841-1901 censuses were microfilmed a slip of paper showing the record series (eg RG11 for 1881) and the piece number was placed alongside the pages, so it appears in the image. Technically a folio is a sheet of paper, but for our purposes it refers to a single leaf of an enumeration book (ie two pages). Enumeration books had pre-printed page numbers, which are small and can be hard to read, but the folio numbers were added later using a handstamp - they're much larger, and can be found in the top right-hand corner. Whereas every page bears a page number, only the front side of each leaf is stamped with the folio number (usually in the top right-hand corner). However the ink often shows through to the other side of the paper, and if so it will appear as a reversed image. Both Ancestry and Findmypast set out the 1881 references neatly, and in the same order as you would enter them on your My Ancestors page - it really is difficult to go wrong with the 1881 Census, especially since you should be taking all the data you enter from the transcription. Every relative entered on your My Ancestors page is a potential link to a 'lost cousin' - but the LostCousins system can only match your entry with your cousin's entry if you've both entered the same data. Computers are pretty smart, but they can't read minds (at least, not yet). I get a lot of emails from members asking me whether they've entered the correct census references when completing the My Ancestors page - and 99% of the time they have. However, because it takes me a long time to check their entries (even if they've got them all right), I decided that it would be better if members could easily check the entries themselves. On your My Ancestors page you'll see in front of the census references for each of the relatives you've entered from the England & Wales censuses (1841, 1881, 1911). When you click the symbol it will automatically search the relevant census using the census references listed - and show you (in a new browser tab) who is entered on that page of the census. Tip: this search uses the Findmypast.co.uk website, but you don't need to be a subscriber to view the search results. If you get 0 results this almost certainly means that you've entered the wrong references - if you get any results at all then you've probably entered the correct references (but just to be sure, check that the head of the household is amongst the search results). Tip: most errors are simple typing mistakes - but it's also possible that you didn't notice the advice on the Add Ancestor form; in this case click your relative's name to display the Edit Ancestor form - the same advice will be shown there. The British Newspaper Archive now includes over 9 million newspaper pages from British and Irish newspapers in the British Library collection (the 10-year project will eventually include an incredible 40 million pages). All of these articles are also available at Findmypast, but at the British Newspaper Archive - which caters for a different audience - the search options are more varied and more powerful. Until the end of October you can purchase a monthly subscription to the British Newspaper Archive which will cost just £1 for the first month - it's a great opportunity to search more than 100 million articles (my estimate) and find out things about your ancestors that you'll never learn from the censuses. For example, I discovered that one of my relatives had been fined for driving at the breakneck speed of 30 mph - and that one of my direct ancestors had been sentenced to one year's hard labour for breaking into a shop and stealing tobacco. Just as well he wasn't transported (or worse), otherwise I wouldn't be here today! Even if you've got a Findmypast subscription it's worth spending £1 to try out the different searches that the BNA site offers - I find that being able to exclude certain keywords is particularly useful. Please bear in mind that your subscription will renew automatically at the end of the month at the full price of £9.95 unless you change the settings in the My Account section of the website - but it's easy to do and no phone calls are necessary. When you go to My Account click on Personal Details (or choose Edit Details from the dropdown menu) - you'll see "Auto-renew my subscription" right down the bottom. In 2011 I wrote an article for LostCousins about the improbable life of barmaid Eliza Dinah Fairchild, born in Southampton in 1856, who in 1877 she married Henry Digby Sheffield, the brother of the 5th Baronet Sheffield. This wasn't her only romantic connection to the aristocracy: in 1905 she sued the Marquess Townshend for breach of promise. This story of social-climbing subsequently won the Federation of family History Society’s 2011 competition and was published in Your Family History magazine. The transformation of barmaid Eliza into society lady Evelyn pre-dates George Bernard Shaw’s 1912 play Pygmalion (which, after Shaw died in 1950 became the musical My Fair Lady) so it's quite possible that Eliza Fairchild was the original inspiration for Eliza Doolittle. With family history there is always more to be discovered. In the case of Eliza, or "Evelyn" (the persona she so successfully adopted), the research reveals an even more bizarre and improbable story. After the article was published I connected with Evelyn’s great-great nephew, Ian Fairchild, through Lost Cousins and together with distant cousin Kate Parker (who originally found Eliza’s story), we continued to trawl all sources. 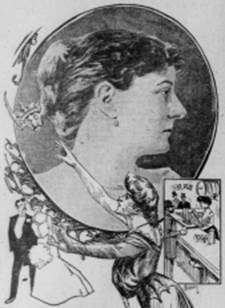 The most productive source for Evelyn’s life after the death of her husband in 1888 was the News of The World report on the 1905 law suit against the Marquess. In the article it mentioned Sir John Sebright, someone she looked on as her guardian. Later in the piece it says "she was regarded as a wealthy woman: she lived in a good house, well-furnished, and had good pictures around her". The source of her pictures is probably explained by the will of Sir John who died in 1890. He went bankrupt in 1887 with debts of more than £140,000, a colossal sum for the time. In his will Evelyn was left £500 and his photographs, pictures and albums. Sir John’s widow was not left destitute, however, because it was reported that his life was insured for £140,000. Sir John’s grandfather, the 7th baronet, bred the highly decorative Sebright Bantam. Another gentleman mentioned in the News of The World was a Mr Tallerman, with whom Evelyn was apparently "very friendly ". I found nothing more on Mr Tallerman until I chanced upon an 1894 patent application in the name Tallerman and Sheffield which had been filed in Victoria, Australia. The patent covered medical equipment: given Evelyn’s society background I thought this bizarre, but once again truth was stranger than fiction. Lewis Abraham Tellerman had been born in London in 1845, and had been in business with his older brother Daniel, trading as S D & LA Tallerman Colonial & Export Merchants until 1881, when Lewis took full control. Daniel was in Australia between 1853-68 and developed a method for preserving and transporting meat in cold storage; when he returned to London he introduced cheap restaurants and penny dinners to popularise Australian meat. Lewis also spent part of the 1870s in Australia, and on his return about 1880 he developed and patented the Tallerman-Sheffield Hot Air Treatment of Disease for treating rheumatic-gout type conditions with super-heated air. The Tallerman-Sheffield Dry Air bath was tested successfully in 1894 at St Bartholomew's Hospital and then taken up by that and other London hospitals (an article in The Lancet in 1895 described its use in the North-West London Hospital),eventually spreading to Paris, Berlin, Baden Baden and Philadelphia. He also ensured that the treatment was available for free for the treatment of the sick and disabled poor. Evelyn’s contribution to the invention is unknown, but her name is definitely there in the patent. Lewis Tallerman seems to have been quite a character. He was a Director of the Gaiety Theatre in London, but in 1903 died suddenly at the conclusion of a dinner party he had hosted for friends at the Langham Hotel. By the time of the 1911 Census Evelyn was living in Bromley - her occupation was listed as 'medical'. It would be nice to think that she was a private practitioner of the Tallerman-Sheffield Hot Air treatment but sadly there is no confirmation available at present. Evelyn’s main benefactor mentioned in the News of The World was John Lewis Garden, a Suffolk landowner. Given the improbable connections discovered concerning Evelyn’s other benefactors I decided to check him out in detail. I was not disappointed. Research showed that Mr Garden was the estranged husband of Princess Caroline Murat, the great granddaughter of Joachim Murat, King of Naples and the husband of Napoleon’s sister Caroline. The Garden marriage was not a happy one and the couple lived apart. According to the court report when he died in 1892, Mr Garden left property to Mrs Sheffield valued at £7000 - at a time when many families were living on £1 a week that was a huge sum! The 1861 census shows John Garden staying at Fentons Hotel in St James’s Street, London. According to The News of the World report, which blends facts with Evelyn’s invented origins, she met her husband Henry Digby Sheffield when he lived in St James’s. All the main men in her life appear to have known each other and shared a similar life style. It is entirely plausible that Eliza was employed in an establishment such as Fentons Hotel which has several barmaids listed in the census returns. It will be interesting to see what further research reveals - I am sure she will not disappoint us! Note: if you have access to the British Newspaper Archive, either directly or via Findmypast, you'll find over 20 articles about Evelyn Sheffield between 1905-6. You'll also find an 1896 article which describes how a well-known singer benefited from the Tallerman-Sheffield hot air bath. I've only ever had positive feedback from members who have tried the Repixl photo restoration site, so I'm delighted to have once again been able to arrange an exclusive discount for readers of my newsletter. A 20% discount on all photo editing (but not prints) means that their amazing restoration service will cost just £7.19 rather than £8.99 (which, when you look here at what they can achieve, is an absolute bargain). Alternatively if you've got photos that, whilst not damaged, aren't quite as good as you'd like there's a range of other options starting from just £1.99 (and that's before the discount). The best important thing about the Repixl service is that you don't need to send them your valuable photographs - simply scan them in (ideally at the highest resolution your scanner allows) and upload the image files to the Repixl website. You can upload as many photos as you want - simply uploading them doesn't commit you to anything. This offer runs until Christmas Day, so if you place an order now and like what you see (as I'm sure you will) you'll have plenty of time to place further orders. When you go to your online shopping basket type the code LOSTCOUSINSXMAS14 into the box - the prices will adjust to show the discount (and, provided you use one of the links above, LostCousins will also benefit). Note: you can, of course, also send more recent photos for the Repixl treatment - and if your photos were taken with a digital camera there's obviously no need to scan them in. Once we get back beyond the start of parish registers it can be extremely difficult to find any evidence that our ancestors existed - unless they were rich or titled. But reading an article by Alan Crosby in the latest issue of Who Do You Think You Are? magazine reminded me that there's a database of over a quarter of a million ordinary soldiers from the 1369-1453 period that you can search free online. In March 2011 I wrote about Mapping our ANZACS, a website which offered free access to 375,000 Australian service records from World War 1. Although the link I provided then still works, the original website is closing - the new website is Discovering ANZACs. There are over 200 amazing photographs from the Museum of London's collections in Dickens's Victorian London, many of which had never previously been published. The pictures which show the construction of the Metropolitan District Railway in 1866-67 present an amazing contrast with the current-day Crossrail project. There are photographs of shops, houses, people at work - the 1877 photograph of a second-hand furniture dealer is amazingly lifelike, and almost three-dimensional. I bought my copy of this beautiful hardback book from Amazon - at about half the cover price - and if, like me, you have ancestors who lived in London during the reign of Queen Victoria it’s well worth buying it for yourself as an early Christmas present! Religious extremism, treachery, kidnapping, torture, beheadings - this isn't the boring history I was supposed to learn (but didn't) when I was at school. Charles Spencer's Killers of the King may not be a genealogy book, but if you've succeeded in researching back as far as the 17th century on some of your lines it will help to put things into perspective. And if you think that the Civil War was just about Roundheads and Cavaliers, Parliament vs the Monarchy, you'll discover that the reality was much more complex. Subtitled "The Men Who Dared to Execute Charles I", the book describes the events that led up to the execution of King Charles in 1649, then demonstrates how Cromwell's own regal ambitions created an atmosphere in which Charles II could regain the throne in 1660. Spencer's excellent account then focuses on the frantic manoeuvring by those who had had some involvement in the King's death, and tracks their fate. Some handed themselves in, expecting to be pardoned - or, at the least, to escape with their lives. Others fled the kingdom, only to find that there were few safe hiding places in Europe or the American Colonies. I was particularly interested to see what he had to say about Cornelius Holland, who is believed to have been one of those involved in drawing up the charges against Charles I - because I have a document which bear's Holland's signature (it dates from late 1645, as the First Civil War was coming to a close). Incidentally, after I mentioned Cornelius Holland in the last newsletter I had an email from Nancy in New Zealand, who told me that he's a relative of hers - isn't it a small world! Killers of the King is available as a hardback book, or in Kindle format. On this occasion I bought the hardback, even though it was twice as expensive - perhaps one day I'll bump into the author again, and can persuade him to sign it! When I hire a car abroad I always book through Enjoy Car Hire, based in Norfolk - because they offer amazing prices. For example, those of you who are coming to Genealogy in the Sunshine next March will have found that you can hire a car for less than £5 a day and - uniquely amongst low-cost car hire websites - Enjoy has a fair-fuel policy, which means you won't be charged for fuel that you don't use. Just after the last newsletter was published the Government launched a public consultation about peer-to-peer lending and tax-free ISAs. Currently you can put your money into a risk-free Cash ISA with an interest rate so low that the fact it's tax-free is pretty meaningless - or you can buy a Stocks and Shares ISA, which might offer a higher return but also involves a high degree of risk to your capital (which reminds me - I read today that the Serious Fraud Office is carrying out a criminal investigation into the accounting irregularities at Tesco). So I'd encourage you to read the consultation document and respond - although you might prefer to wait to see what recommendations I make (the consultation is open until 13th December). I had several emails from readers following my article about the sinking of the Empress of Ireland - sadly several of you lost relatives in the tragedy. I was hoping to include a follow-up article in this newsletter, but I've run out of space (and time) and will have to defer it until the next issue - so if there's anyone else who has connections to the ship please let me know. In the meantime remember that The Lost Empress, Steve Robinson's genealogical mystery novel is out now! Finally, you might enjoy looking at these rather unusual photos of historic events - I did. Whilst this offers also applies to the 1 month subscription, you'll only save on your first month's subscription - after that you'll pay full price. So my advice is to go for a 12 month subscription so that you lock in your savings for a full year! Note: the terms and conditions on the offer page state that the offer is for new and lapsed subscribers only. But if the link doesn't work for you, see the note at the end of the first article. Thanks for taking the time to read the newsletter - I hope you find it useful. And if so, why not encourage the family historians you're in touch with to join LostCousins? You MAY link to this newsletter or email a link to your friends and relatives without asking for permission in advance. I have included bookmarks so you can link to a specific article: right-click on the relevant entry in the table of contents at the beginning of this newsletter to copy the link. Please DO NOT re-publish any part of this newsletter, other than the list of contents at the beginning, without permission - either on your own website, in an email, on paper, or in any other format. It is better for all concerned to provide a link as suggested above, not least because articles are often updated.